Apart from priming the skin, ice really works wonders when it comes to tightening the pores and giving it a smooth, flawless look. It makes sure your make up lasts for long without you having to spend a penny for it. It doesn’t take a genius to figure out that beauty products can get very, very expensive. With every “must-have” product that hits the store, our credit cards often have to suffer a setback. But beauty lovers will agree, spending that extra penny, even if it burns a hole in your pocket, is worth every bit of it. This is where hacks and easily available household products that do the trick come in to chase away the otherwise expensive trips to cosmetic stores. 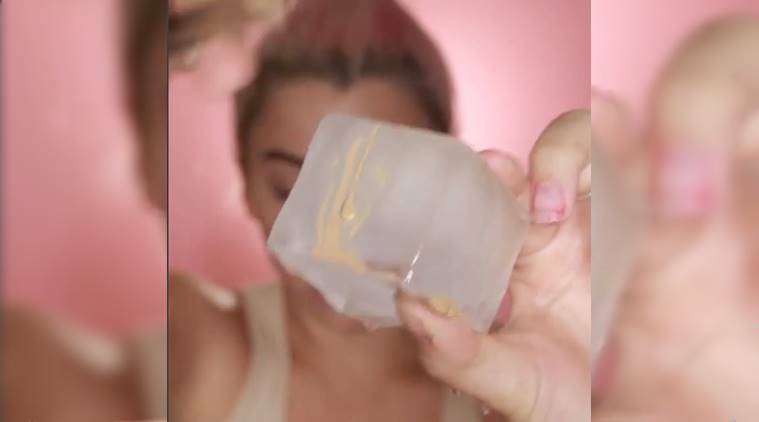 Online makeup artist Ashley Blue DeFrancesco used an ice cube as a beauty blender and also as a primer, and took to Instagram to demonstrate how it works. Captioning the post while confirming that “it really works” as a primer, the beauty vlogger’s post went viral on the social platform. Apart from priming the skin, ice really works wonders when it comes to tightening the pores and giving it a smooth, flawless look. Apart from using ice as a primer on the skin before makeup to make sure the makeup stays for long, here are some more “cool” make up hacks using ice. Run an ice cube over the under-eye area to reduce dark circles and puffy eyes. At times, fine lines and wrinkles show up in these areas. Use an ice cube to tighten your skin and give a smooth look to it. Pimples are things no one would want to sport on their face. But they are unavoidable, thanks to our diet, pollution, and lifestyle choices. Use an iceblock to reduce the swelling and redness caused by pimples. Dab a block of ice on your eyebrows before you decide to tweeze your eyebrows or go for a threading to give them a good shape. It will reduce your pain and bring some much-needed relief. So, ready to include this miracle, no-cost product in your beauty regime? 2 We saw people wearing bucket hats at Paris Fashion Week. Are they back?